Your new favorite crepe recipe! 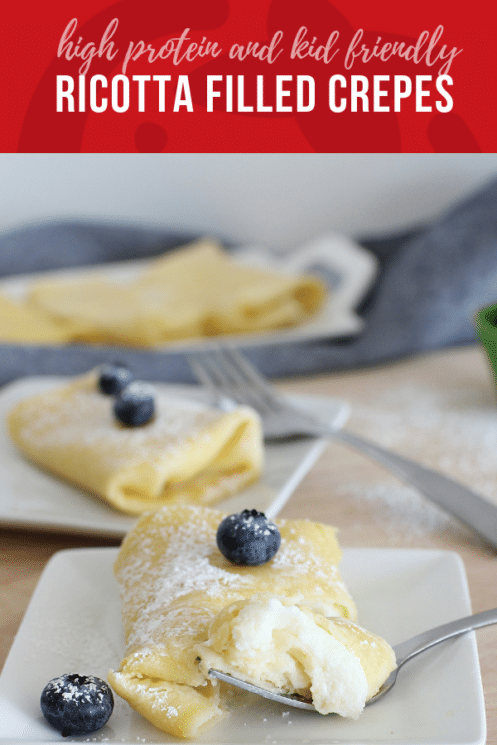 Ricotta Filled Crepes are stuffed with creamy, high-protein ricotta cheese to make breakfast a little extra special, even when you don’t have a ton of time. 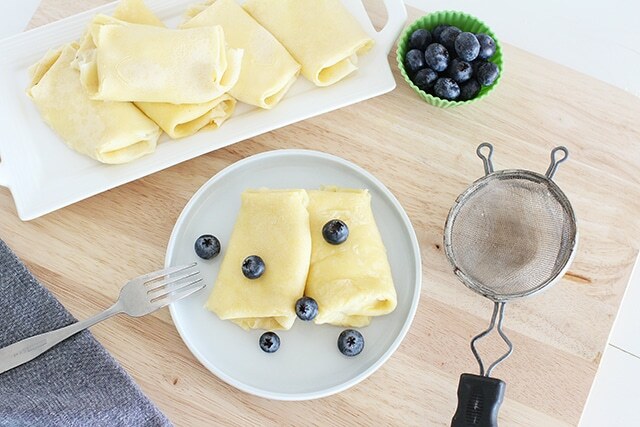 Crepes are one of the most fabulously indulgent breakfasts you can serve your kids. And they have a special little secret: they’re actually not hard to make. At all. In this recipe, the batter comes together fast in the blender, and the filling is made from just two simple ingredients. So let’s talk about taste. 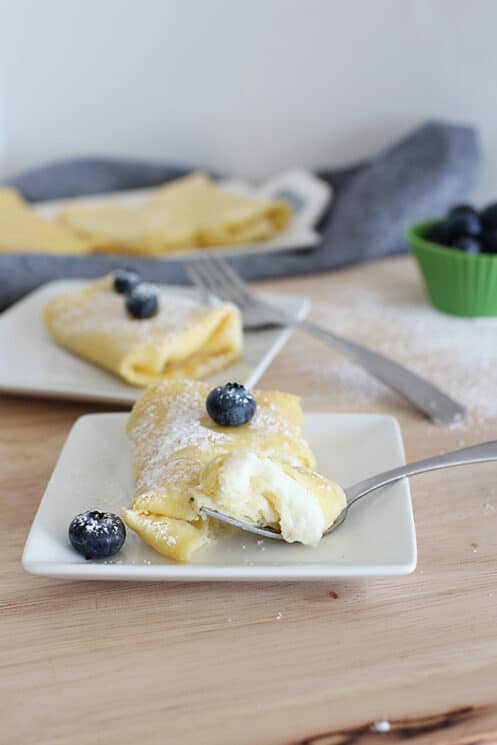 Ricotta Filled Crepes are tender on the outside and creamy on the inside, with a flavor that’s reminiscent of (steady yourself) really good cannoli. Do you need any other reason to make these crepes ASAP? Probably not, but here’s one anyway: they’re healthy and nourishing for you and your kids. What Makes This Crepe Recipe Healthy? Without a doubt, these crepes have a nutritional leg up on the Nutella-filled variety. Ricotta cheese has an impressive 14 grams of protein per half cup, which is more protein than you’d get in two whole eggs. There’s some sugar in the filling, but we kept the amount modest at 1/3 cup. If you prefer, you can reduce the sugar even further, so it has just a touch of sweetness. A sprinkle of fresh berries adds color, antioxidants, and a juicy burst of flavor, too. Don’t be intimidated by this crepe recipe, because it’s seriously no more effort than making pancakes. In fact, it might even be LESS effort. That’s because you can swirl up the batter for these Ricotta Filled Crepes right in your blender cup. No need to treat wet and dry ingredients differently or dirty multiple bowls; just dump it all in together and buzz that batter up until it’s nice and smooth. To get your crepes to have that great delicate texture, it helps to let the batter sit for five or ten minutes, so the bubbles can work themselves out. The next step takes a tiny bit of practice, but if my first-grader can do it, you can too! Pour a ladle-full of batter into a greased skillet (try a measuring cup in 1/4 cup or 1/3 cup sizes, to get the right amount) then swirl it all around. Try to coat the bottom of the pan evenly with a thin film of batter before you set it back on the burner. Voila! 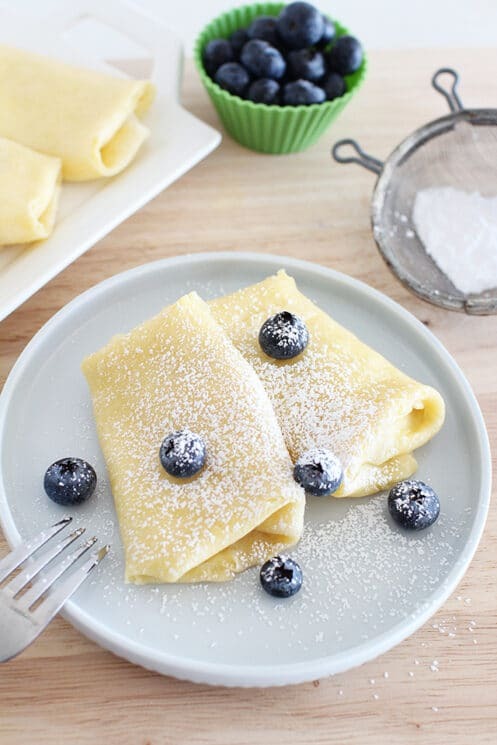 Fill your crepe with a little sweet ricotta, garnish it with berries and powdered sugar, and you have a beautiful and delicious crepe that will impress the heck out of your kids. Melt and slightly cool the butter. Add the first six ingredients to a blender and blend until smooth. In a small mixing bowl, stir together ricotta cheese and sugar. Set aside. Spray a medium nonstick skillet with cooking spray or spread a teaspoon of butter in the bottom; preheat over medium. Once skillet is hot, pour 1/4 to 1/3 cup of batter into the pan and swirl it around until it coats the bottom. Cook for 1-2 minutes per side, or until the edges are golden. Remove from skillet and set aside. Continue until all crepes have been cooked. Spray pan in between each crepe to prevent sticking. 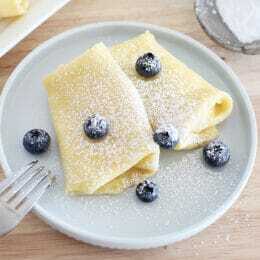 Fill each crepe with 2-3 tablespoons ricotta mixture, without over-filling. Fold like an envelope. Sprinkle each crepe with powdered sugar and serve with blueberries. YUM! Dessert for dinners sounds fabulous! We have a friend who throws a “Crepe Fete” every year, (pronounced Crep Fet) and it was a Crepe party with all the toppings. Of course there was ice cream and pudding, whipped cream and berries- it really WAS dessert. But I could probably convince them to add some ricotta. And ooh yum, I’m gonna throw me a Ricotta Frittata party cuz that looks GOOD! BTW, ketchup boy is hilarious! When he starts to chew it gets bad. Ha! I’d like to be invited to Crepe Fete. Maybe you can start a party for the neighbors, I’ll come! A group of my college friends and I used to do Crepe parties til they all moved away. It is really fun when you get all the different toppings! YUM! Amy, I know that you can substitute cottage cheese for ricotta in recipes, do you think one is better for you than the other or are they about equal? Amy- I will host a Crepe Fete! I bought a crepe maker 5 years ago for that very purpose. Of course, it’s still in its nice, pretty box. I will tell you though, my fave crepe topping is Nutella. You can bring Grape Nuts and raspberries to combat my evil ways. (And of course, ricotta) And I know there’s a whole wheat recipe included in the box so we can fake healthy, if you’d like. Liz, it’s hard to compare because you have the low fat, light, whole, regular, etc. But I think in general ricotta has more fat, which would make me prefer cottage cheese. But you are right, you can substitute either in recipes. I guess Emily’s going to have a crepe fete for us. See you there! I am doing a juice “feast” right now. And boy, does this look good! Any food would look good if you are on a fast (feast) I’m sure! Haven’t made this yet but was looking for something with ricotta. . . have you ever tried making a batch and freezing? They look delicious, can’t wait to try! Hi Karen, we haven’t tried freezing these yet. The texture of ricotta can turn a bit grainy in the freezer, which might not be ideal. But they do taste delicious made fresh!